Bladderwort is unique in that the underwater leaves bear small oval “bladders” that trap and digest small aquatic creatures. Bladderwort is usually found in quiet shallow, acidic waters and can form dense mats. Submerged portions of all aquatic plants provide habitats for many micro and macro invertebrates. These invertebrates in turn are used as food by fish and other wildlife species (e.g. amphibians, reptiles, ducks, etc.). After aquatic plants die, their decomposition by bacteria and fungi provides food (called “detritus”) for many aquatic invertebrates. 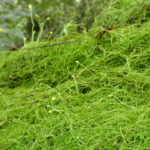 Bladderwort has no known direct food value to wildlife.